Purchasing a mobile home is much cheaper than purchasing a new, modern house. However, it is possible to create a modern dwelling from a mobile home. Make a few modifications to the exterior to integrate the structure into the landscape. Update the interior finishes with modern materials, and your mobile home can feel just like a house. With the right lighting, furniture and decorative touches, your mobile home will look chic and sophisticated. Clad the exterior with modern materials. Most mobile homes are covered with aluminum or vinyl panels or siding. Instead, use an unexpected material such as wood siding or modern-looking metal panels. Alter the roof structure so it is not the tell-tale pitched form of most mobile homes. Try a single pitched plane, or an inverted V-shape. Repaint dark wood paneling a light color. Many mobile homes feature wood wall paneling or trim, which can look dark and outdated. A light paint color, such as white, beige or gray, can make the space feel brighter, larger and cleaner. Replace worn-out carpeting or linoleum. These are standard flooring finishes for mobile homes, but you may install wood or laminate flooring, just as in a traditional home. Carpet tiles also look more modern than standard rolled carpeting. Install modern back splashes in the kitchens and bathrooms. Recycled glass tile is available in many rich colors and lends an air of elegance to otherwise utilitarian spaces within your mobile home. Update the light fixtures. Look for modern light fixtures that hug the ceiling so they don't intrude in low spaces within your mobile home. Opt for wall sconces or build cove lighting to maximize the ceiling space. Choose fixtures plated with brush nickel or chrome, which look especially sleek. 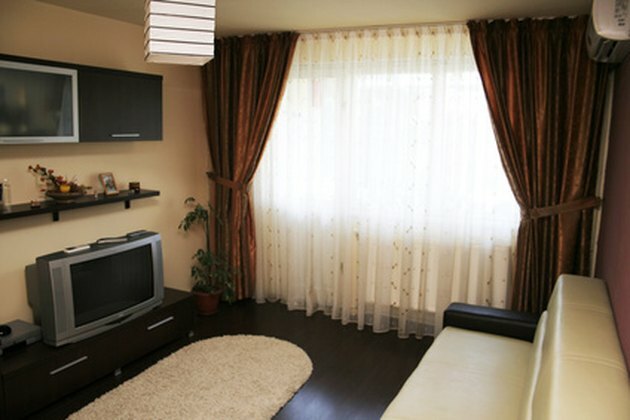 Complete your mobile home's modern conversion with the right furniture and decor. Install open shelves along the walls so you can organize your belongings without cluttering the area. Stick to minimally designed furniture that maximizes space. Avoid sitting too many knick-knacks around, and keep your presentation well-edited.